There are many spiritual traditions all over the world, spanning across many centuries, and belonging to different faiths such as – Hinduism, Christianity, Buddhism, Islam, Judaism, Sikhism, Jainism, Zoroastrianism, Taoism, and others. In all of them, we see an outward ritualistic aspect, teachings and tenets, as well as an inward spiritual practice. These spiritual practices are developed keeping in mind the different orientation and stages of spiritual growth that the aspirant might be in. The time-period and place of origin of the many religions would account for the diversity we find in them. However, all religions speak of the same universal values. Bhagawan has beautifully conveyed this in a discourse in Prasanthi Nilayam, given on July 10, 1996. What is the real meaning of religion? To realise is religion. Follow the religion of love. This is the sacred principle that all religions of the world teach. These sages declared that they had seen God. Where did they see Him? They saw Him beyond darkness. What does darkness connote? It connotes ignorance. The sages saw Him not in this physical and external world but in the inner world, in the firmament of their inner being. In every human being, God shines beyond the darkness of ignorance with all effulgence. When one leads one’s life like a human being and conducts oneself like a human being, one can become God himself. Then one will become eternal like gold that does not change with the passage of time. Every tradition talks of the deep connect between the individual and God. ‘Man is a spark of the Divine’, declares the Gita. ‘Man is made in the image of God’, reiterates the Bible. The goal of every spiritual endeavour is to realise that God is within us, and that separation is the ultimate illusion. When we overcome ignorance, we visualize the inner Divine Effulgence, and this is the essence of the spiritual journey. This series of articles will strive to bring out those gems from Bhagawan’s teachings that talk about this essential unity, which devotees have experienced in their tryst with their Swami, or that have been revealed to them in their spiritual journey with Sai. Instead of furthering the illusion of separation which binds us to this world, let us embark on the inner journey that leads us back to Him. Born in Niagara Falls, New York, Lyn Kriegler earned a BFA in Fine Art and English with honours from Virginia Commonwealth University in 1971. After graduation she worked as an illustrator and art director. She settled in New Zealand in 1974 where she began working in the field of book illustration, fine art and design, specialising in children’s books; of which she has published over 150 titles and won several awards. She was invited to join the New Zealand Book Council Writers In Schools Programme in 1990, and is a frequent guest speaker, artist and storyteller in schools throughout the country. Lyn received a copy of Gita Vahini from a Collins Books rep shortly after her arrival in New Zealand, which culminated in over 30 trips to Prashanthi Nilayam, three cherished interviews and numerous conversations with Swami in darshan lines. Since 1990 she has assisted many Sai devotees in writing and publishing books of personal experiences, insights and realisations. In 1995 Bhagawan commanded her in private interview to initiate a Book Centre in New Zealand, which has evolved into the Sathya Sai Baba National Library and Book Center in Balmoral Road, Mount Eden, Auckland. Lyn lives and works from her studio in Karekare Beach, overlooking Auckland’s wild west coast. April 24, 2011. It’s 5 pm Easter Sunday. At 6 pm I am due to give a talk on the resurrection of Jesus to about 250 Sai devotees gathered in Auckland’s Mount Roskill Grammar School Hall. Suddenly everyone is looking at their mobiles and whispering, shaking their heads, starting to sob. Swami has left His body. The news ricochets around the hall and I see the office bearers and elders conferring as more people arrive. People are settling in their seats and the chairman gives the official announcement. My talk is to follow his introduction to the programme. There is complete shell shock in the audience – tears, tears, and more tears. Out of the corner of my eye I see Uncle Muru coming towards me. “Lyn”, he whispers calmly in my ear, “this is a time for spiritual maturity”. My mind went back to an insightful interview with Bhagawan that had happened in February 1997. “Where is God?” Swami’s powerful voice rang out. It followed a quiet moment in His interview room in the Prasanthi Nilayam mandir. I had been studying His feet, nestled in a lovingly handmade cushion that resembled an open-petalled pink lotus. I had been lost in thought because it was me that Swami had been correcting earlier. It was just 8 a.m. The chanting of Vedic hymns was echoing throughout the mandir. He had started the ball rolling by asking our group, “Any spiritual questions?” I quickly raised my hand. 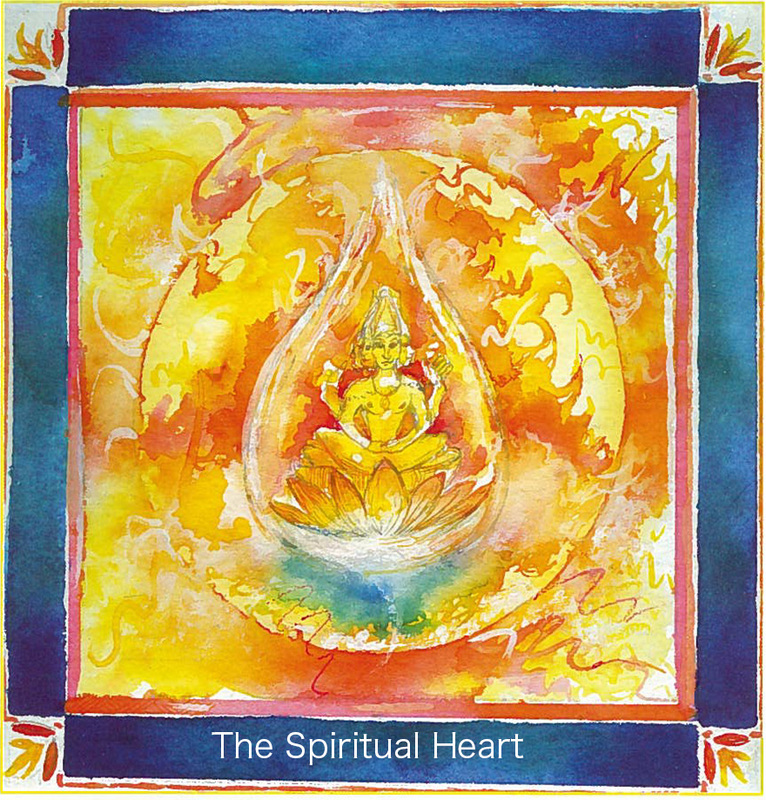 Swami said, “What you do not understand is that you have two hearts. Heart on the left is a pump. Its duty is to pump the blood. Heart on left is full of desires; desires lodge in the muscle tissue of the heart and cause you pain. Too much pain brings heart problems and circulation difficulties. “To the right of the physical heart is the spiritual heart.” He pointed to the centre of His chest about seven inches directly below His Adam’s apple. So how do I know when I am near to God? How do I know God is near to me? 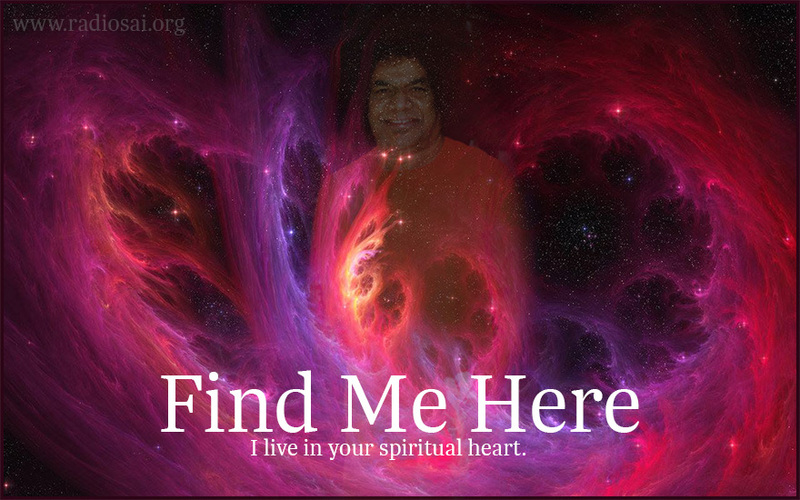 Swami answered these two questions for me and one extra – “Where is God?” and His answer rang out, pointing to each one of us – “God, God, God, God, God, God, God” – Divine wisdom was being imparted to us. Ms. Mata Betty, a long standing devotee of Bhagawan, constantly returned to this; it was her favourite theme above all others - “God lives in your heart. Your ultimate destination is the Country of the Heart.” She would constantly quote from many revered spiritual sources. A quotation from Dr. Daniel Fry’s American magazine, “Understanding”, of March 1972, has a remarkable fact. It noted that a certain Dr. Hamish had discovered, that within the back of the fourth chamber or auricle of the heart, there is a fifth chamber, and within this chamber was the ‘Divine Atom’. He found that this chamber was an airless cell and maintains a perfect vacuum. When exposed to a microscopic camera and enlarged up to a million times, the magnified atom becomes visible. It appears as a mature and sexless human being in perfect youth. It remains free from all human qualities. It stands upright without touching the cell walls anywhere. Russian research also has confirmed its existence. Mata Betty embraced this picture wholeheartedly. I know she meditated constantly on her spiritual heart, and had a clear vision of how it actually looked and functioned. It has been known by many names throughout history and mentioned in many sacred scriptures: The Sacred Heart. The Bundle of Life. The Golden Bowl. The Jyothi. The Unfed Flame. The Threefold Light. The Light of the Self. The Golden Disc. The Little House Shaped Like a Lotus. The Robe of the Tathagatha. It was there that she found her Sai.